Chartwell participated in a Soles4Souls shoe drive. 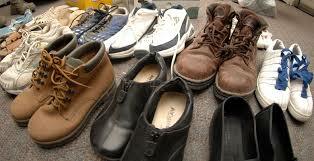 The organization's mission is to fight poverty by collection and distributing shoes to those in need. Since its inception in 2006, Soles4Souls has collected and distributed 26 million pairs of shoes worldwide. Through the efforts of all offices, Chartwell donated a total of 3,711 pairs of shoes! Thank you to all of you who donated shoes or otherwise assisted in this campaign!